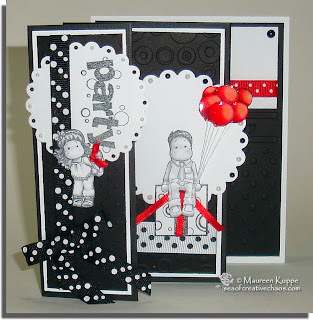 Black & White with a Pop of Red! 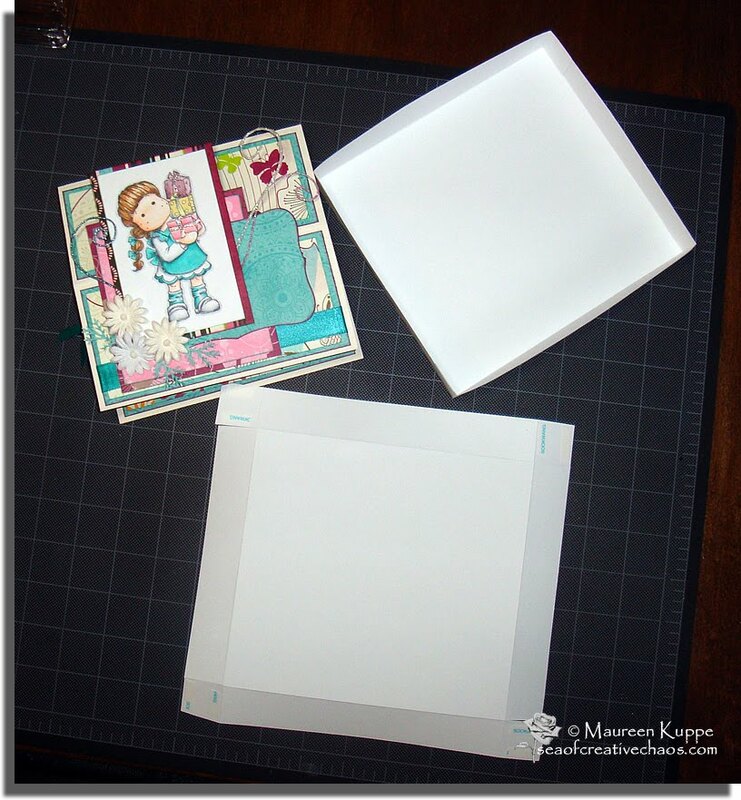 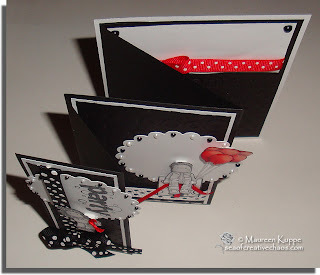 Here is a card using JUST PAPER! 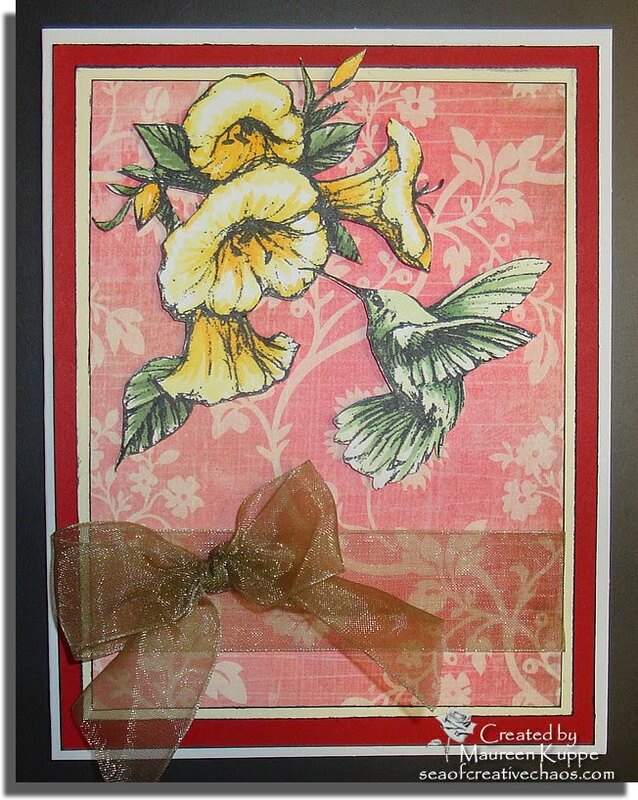 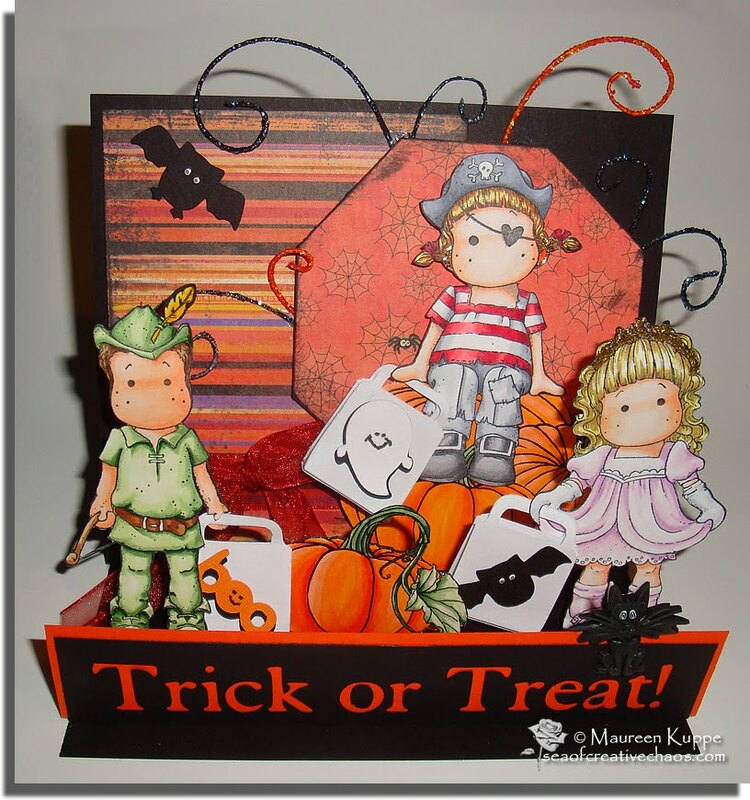 Yep, everything on this card is made from paper - all the embellies and even the flowers which were made from TISSUE PAPER! 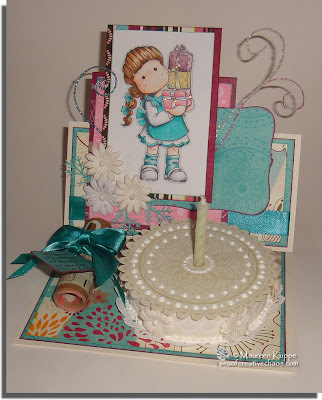 I started out with wanting to use this oh-so-cute Tilda with Flower Pot. 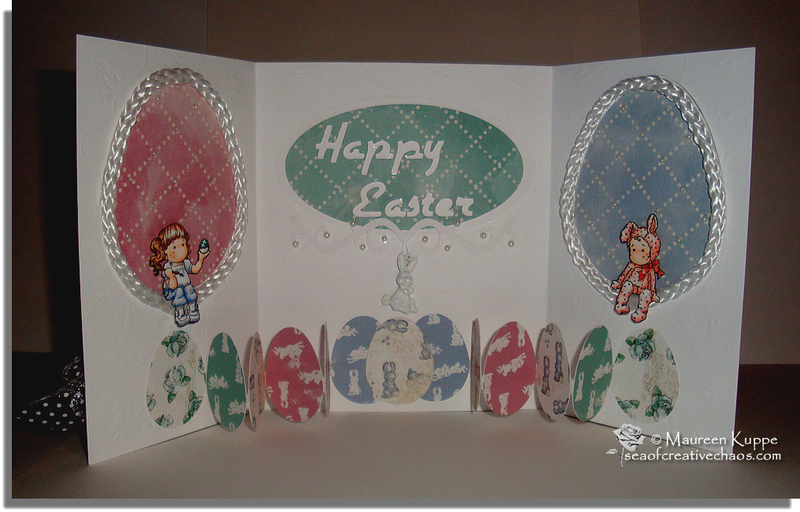 The background patterned paper is Bo Bunny's "Calypso Dream". 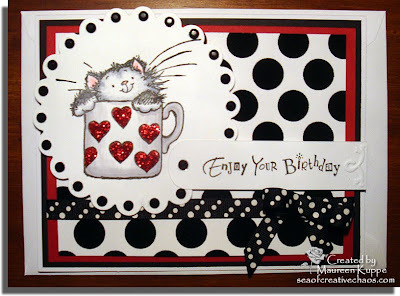 I rounded off the corners and inked the edges using ColorBox ink. 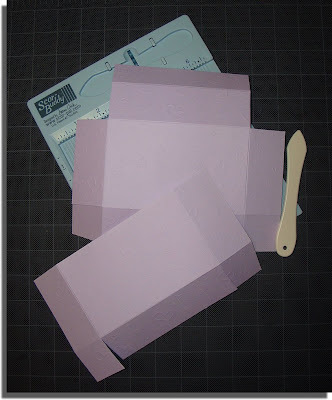 To mat it, I broke out something I haven't used in years; my Provo Craft Paper Shapers scissors! 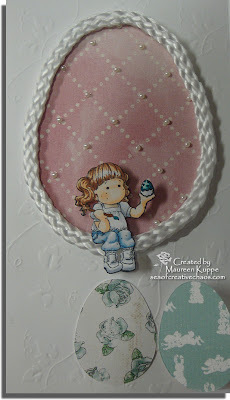 The second layer of darker blue mat was cut using my Martha Stewart Eyelet Lace punches. I used my Cricut a lot for this project; I just bought the "Give A Hoot" cartridge at half price, so I had to put it to good use. 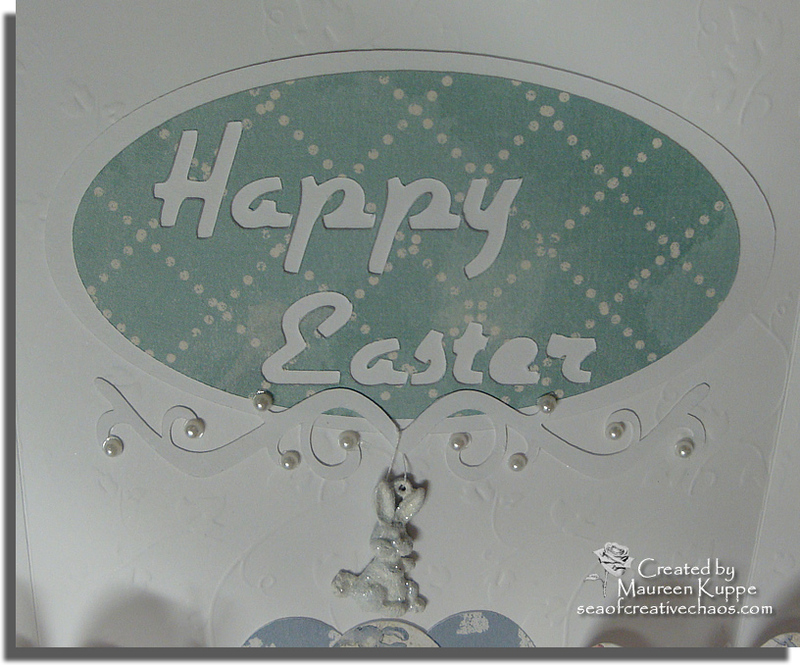 The sentiment, leaves and flower cutouts are all done on the Cricut. The swirls were created with my Cuttlebug and Sizzix dies. 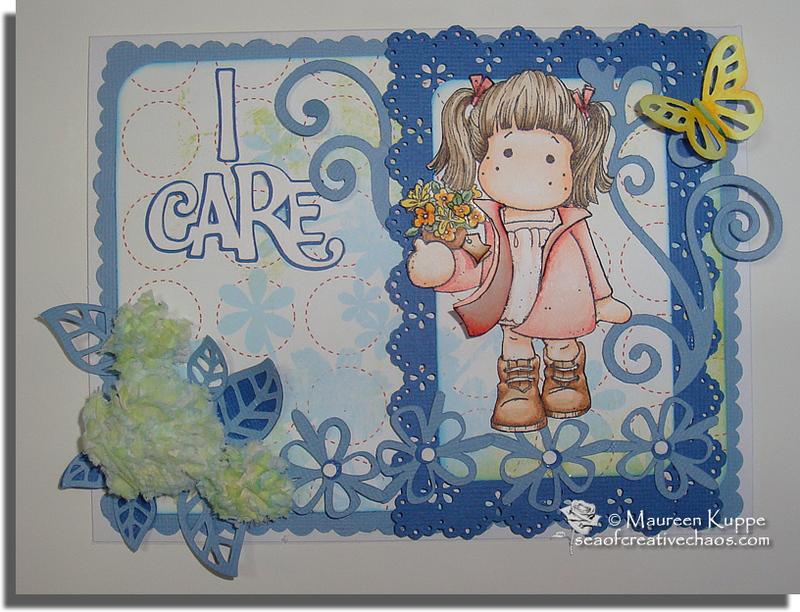 I have added 3D hair ribbons, coat lapels, flowers and leaves, and the tag hanging off the flower pot. 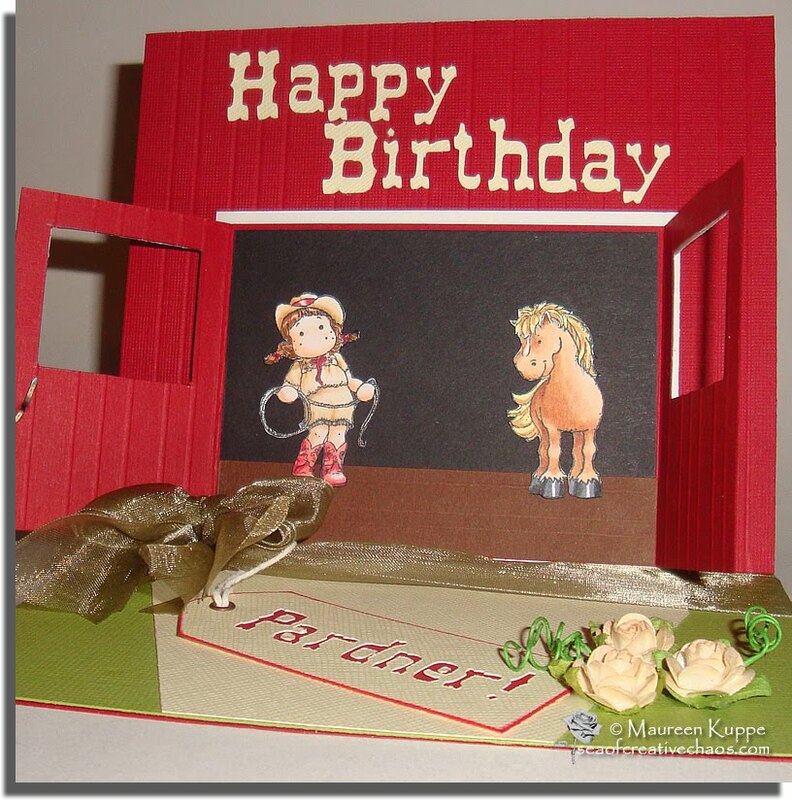 So even if all you have is paper, there is A LOT that can be done to create interest, texture and special effects! 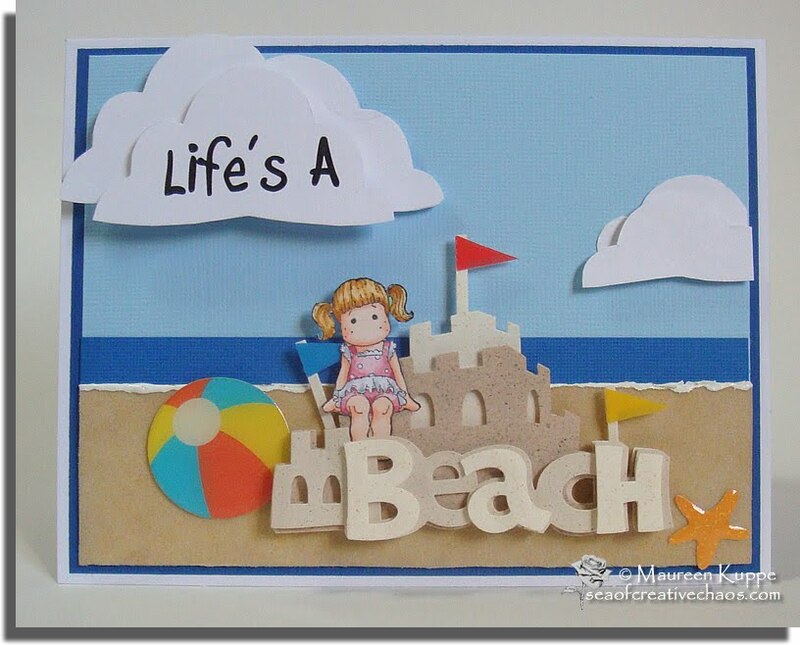 I chose Beach Tilda for this project as she's just the right size to sit on her majestic sand castle! I simply used cardstock for this project; layering it multiple times for the sky, water, clouds and beach. 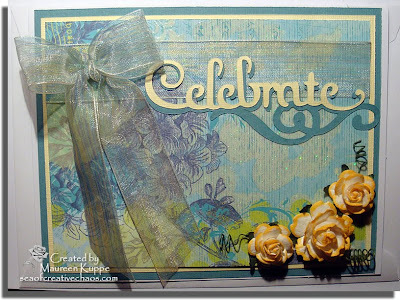 For a textured sandy surface, I added a solid piece of Scor-Tape (cutting down one of the sheets to size) to a beige cardstock piece. 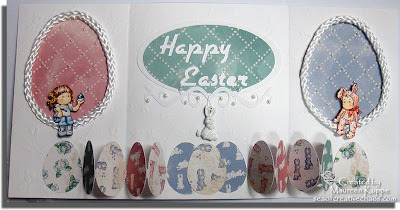 I then pressed a mixture of white and yellow flocking powders onto the exposed tape - Viola! It worked perfectly! The wave whitecaps were added with dimensional white paint. 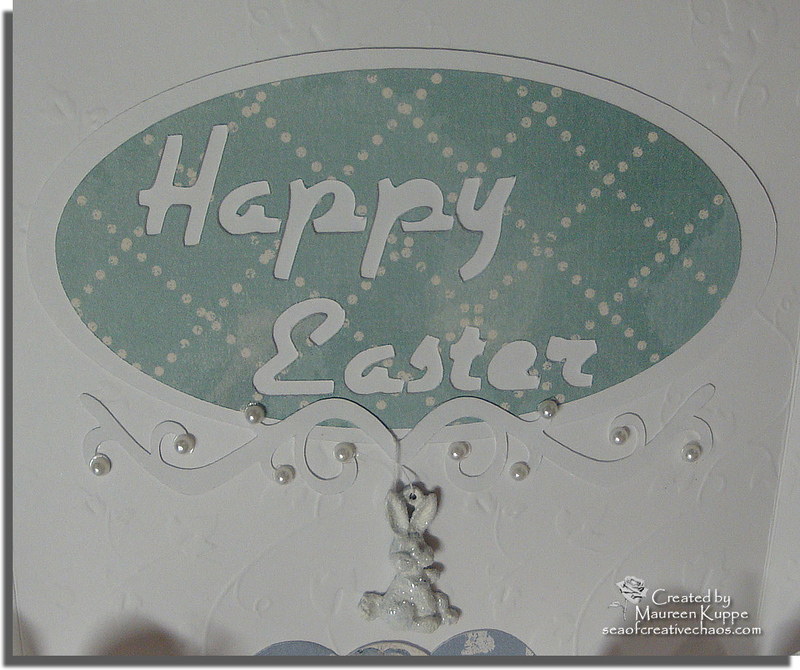 I printed the sentiment onto white cardstock and cut cloud shapes, stacking them and adding dimension with foam tape. I finished off the beach scene with a beachball and starfish from the same Recollections sticker package. 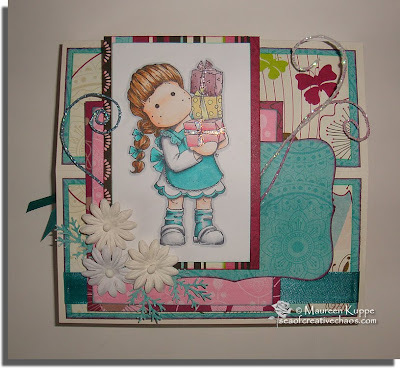 With the temps at 34 to 36C this week, I definitely WANT to be joining Tilda at the Beach! Here's a card I wanted to make for my niece -- she and her husband recently moved back to our city and it was the first chance we got to meet their 7 month old daughter! 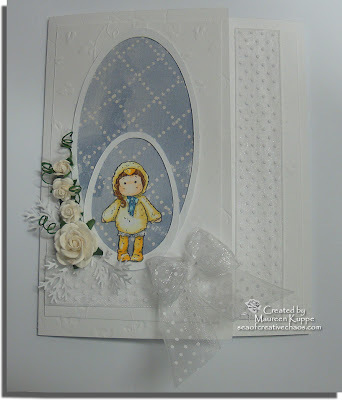 So I didn't want to do the typical "new baby" card. 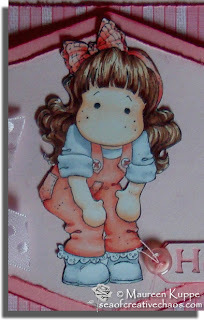 Instead I thought this Tilda With Lace Jeans stamp was just perfect; it's like she is saying "Why Hello There!" to a little one. I started out by using one of my favorite double-sided papers, GCD Studios # 210 "Tinted Rose Stripe" and used the front striped side for the center panel. But the other side was quite plain and I wanted to have some soft swirls on the side panels to offset the hard stripes, so I added the pattern myself using Memento's Angel Pink ink and a foam stamp I got years ago. I distressed and inked all the paper edges with ColorBox Magenta ink, added some pink polka dot ribbon from Michael's (using my Bow Easy, of course!) 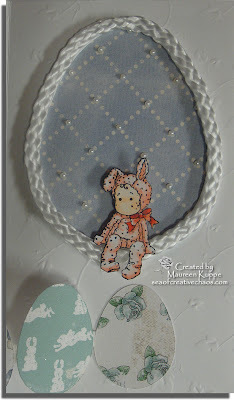 and a teenie button from my stash was sewed onto the sentiment tag. I used my wonderful Cricut and Sure Cuts A Lot software to create the center hexagons and made the tag using my Cricut with Plantin Schoolbook cartridge. Foam dimensionals were used to pop the hexagon up over the background papers. 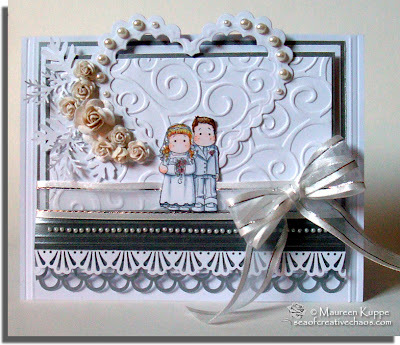 Here's a card that's just black and white ... with a pop of one colour; I love the POP! of red against the stark black and white, so each section of my accordion card has a touch of red. 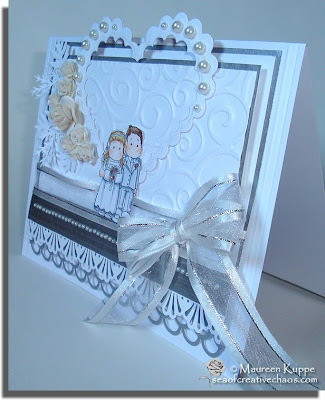 I used two Mini Magnolias on this project: Secret Tilda and New Years Edwin. I also kept the colouring of these two stamps monochrome (Copic list is below). I didn't use any patterned paper again! 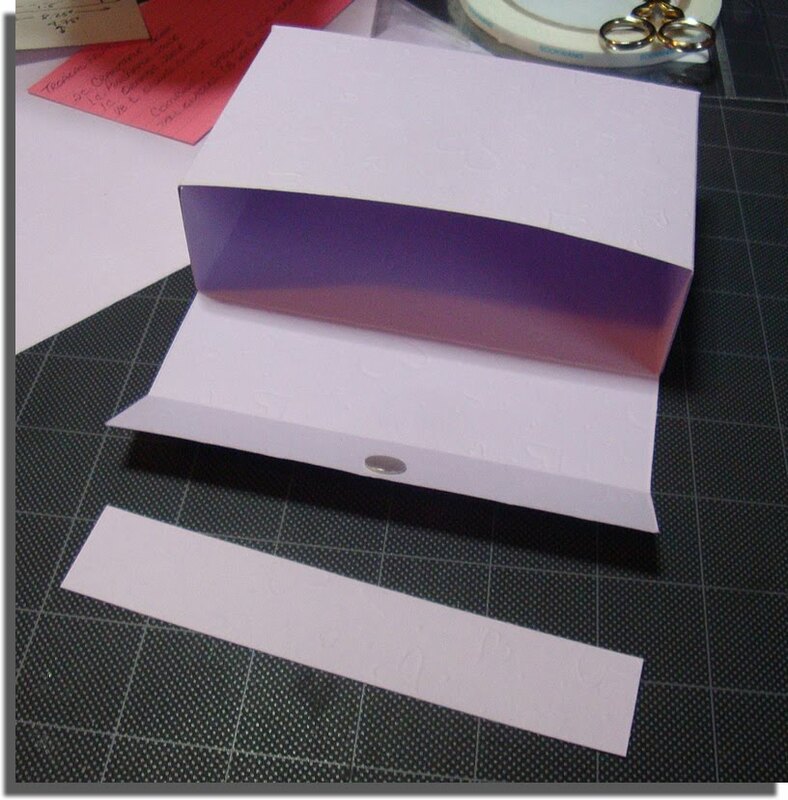 Instead, I cut and folded black Bazzill cardstock for the base. 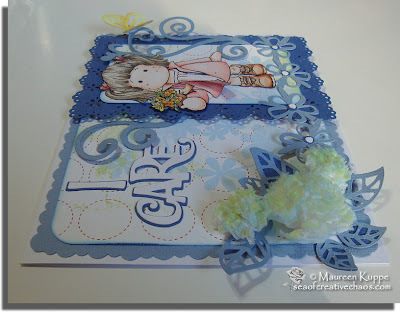 The front of each section has a panel that's been embossed using my Cuttlebug. 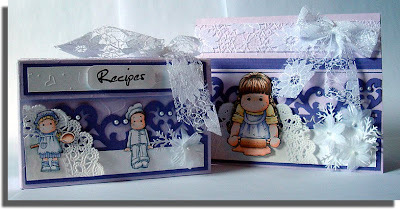 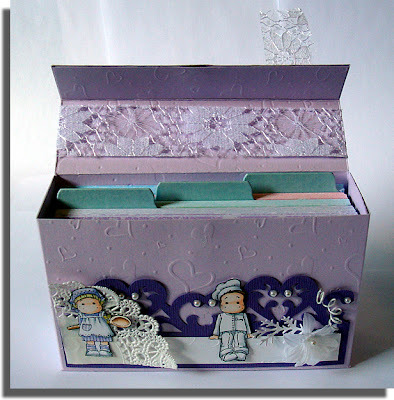 I kept to a dot pattern both in the embossing and in the ribbons for continuity. 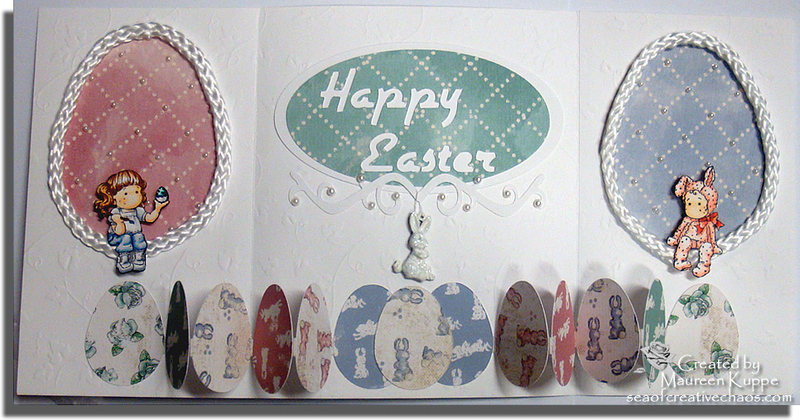 Spellbinders scalloped circles were cut and some Michael's pearls in both black and white added. 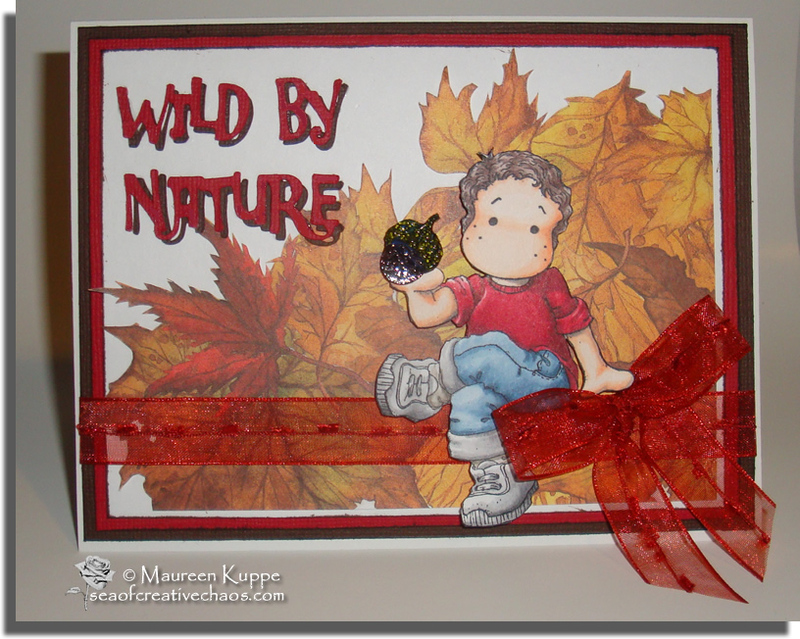 A few other stamps from my stash were used here and there, including one that had balloons in it. After colouring with Copics, I added some gloss with All Night Media's Clear Gloss, then attached six strings of white thread so Edwin could hold them. Dimension was added with foam under Tilda, Edwin and the balloons. 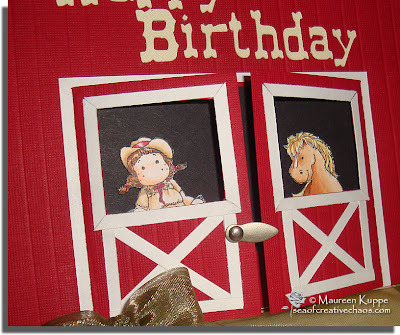 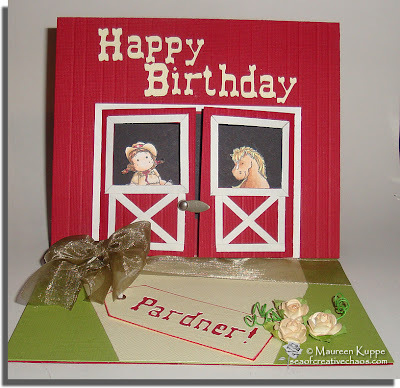 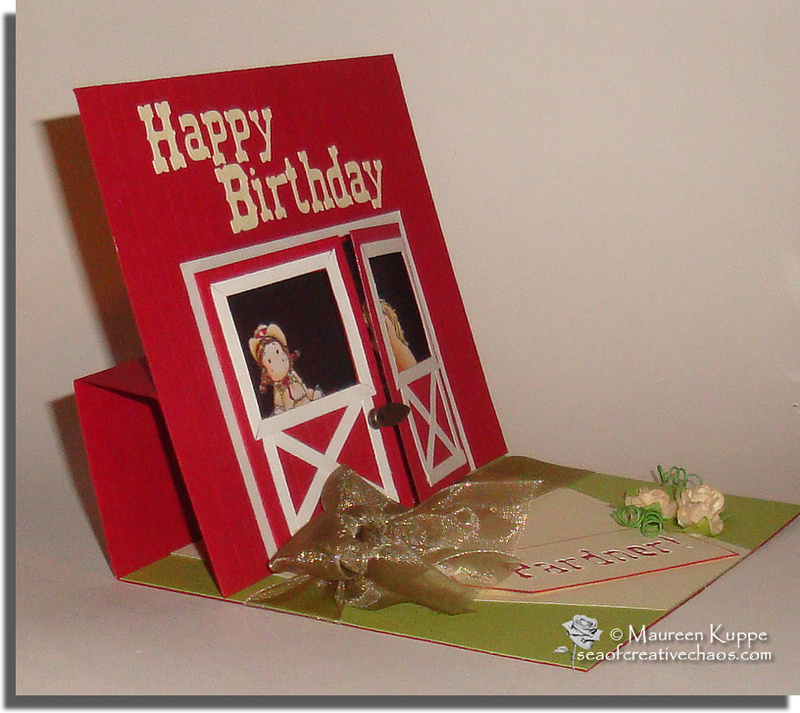 I made this barn card for a western-style birthday. 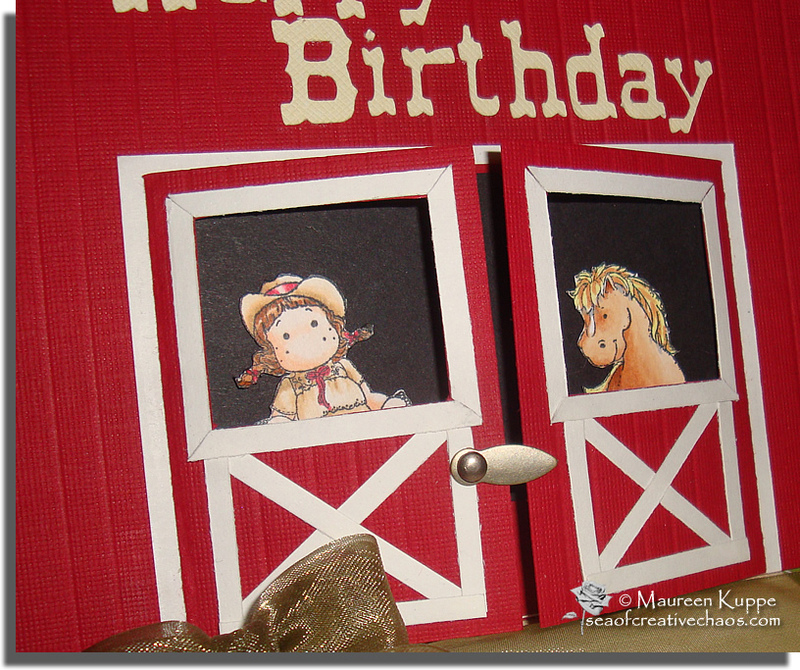 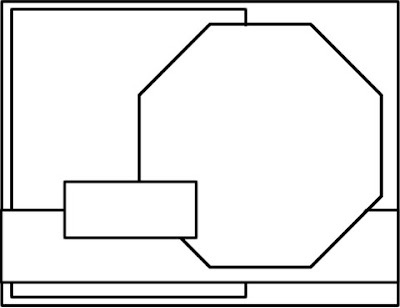 If you look closely, I have scored it to create the wood panels on the barn, doors and even inside on the wooden floor. 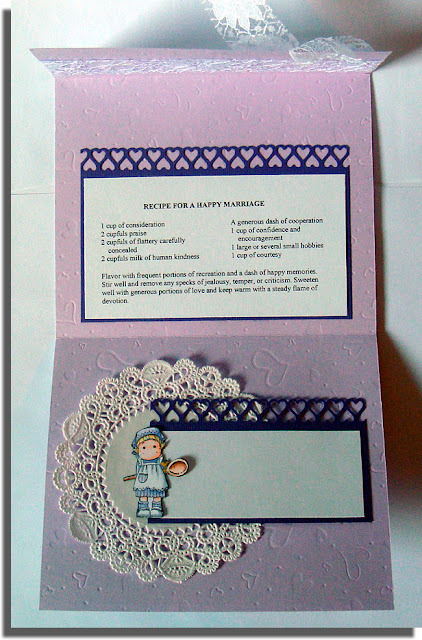 There is no patterned paper on this card; just Bazzill cardstock. I attached the white framing with 1/8" Scor-Tape; it made it so easy to do! 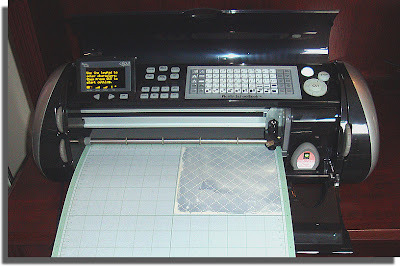 I also got my Cricut going and cut out my text using a Western font. 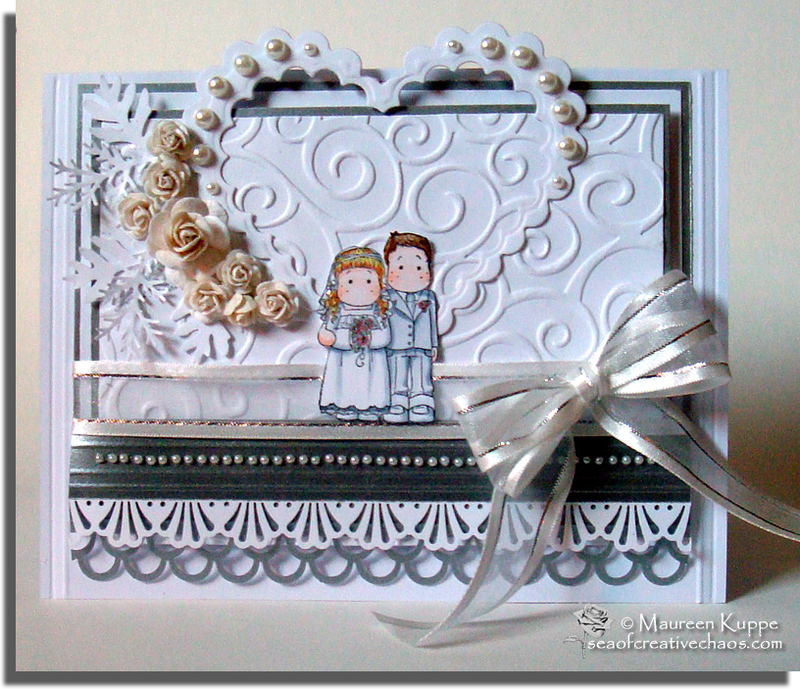 Some Dollar Store sheer ribbon, Michael's roses, brad, clip and string was all that was added.